Just got back home after a wonderful week in North Sikkim, photographing birds in the cold heights of Lachen, Thangu & Lachung. There are a few lovely moments from the trip that will remain etched in my mind – the one right on top would be the mind-blowing session with a huge flock of Grandala. The male Grandala is such a stunningly coloured bird that I couldn’t help but gasp when I first sighted it. He has a shiny royal-blue plumage, evocative of Robin Liquid Blue (that would bring back childhood memories for people of my generation in my country). When kissed by sunlight, the royal-blue tends to lose its iridescence and appears white at some angles. This was just a single individual though, he must have got left behind by the rest of the flock. Or perhaps he stayed back on purpose to give us a preview and prep us for the grand spectacle the next day. Whichever it was, that was quite unexpected as these birds always are found in large flocks – security in numbers helps protect them from raptors. 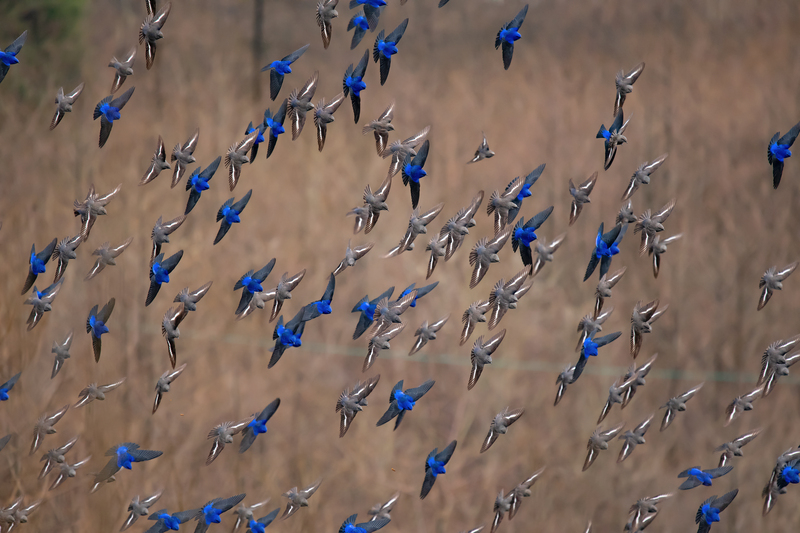 They also seem to fly in unison – just one of them taking off triggers a sequence of all the other birds following suit. And they invariably settle down on the same tree – a Grandala tree is quite a sight to behold and looks as if the tree is full of brilliant-blue flowers or fruits. Given my recent fascination with flocks, I had to capture one of the flock flying. I didn’t have a wide-enough lens to get the entire flock (must have been about 600-700 by our reckoning), but this frame captures the essence of the sight.